The Ultimate Desert and Delta Safaris' experience! Departs daily from Victoria Falls or Livingstone: In the morning you will be collected from your hotel in Victoria Falls by a Desert & Delta Safaris representative for your 2-hour road transfer to Kasane Airport. There, you will be assisted onto a private air charter to Savute Safari Lodge, located in the southern part of the Chobe National Park. Enjoy 2 nights Savute Safari Lodge on a fully inclusive basis. It is breathtaking to think that the Seven Hills of Savute, collectively known as the Gubatsa Hills, were formed some 980 million years ago and were shaped over the enturies by the ancient Makgadikgadi Lake that finally dried up some 30,000 years ago … Whilst the latest geological phenomena to radically change the face of Savute’s landscape were the gentle tectonic movements of Northern Botswana’s earth plates... This movement of the tectonic plates happened only two decades ago and hardly discernable at the time – which caused the Savute Channel and its dependent Savute Marsh to parch and dry-up completely. In 2009, after another extended hiatus, the channel began flowing again and by January 2010 had spilled into the Savute Marsh for the first time in three decades. No-one knows how long the water will remain… It is on the banks of this, The Stolen River, that you will find Savute Safari Lodge in a setting of singular beauty. The lodge’s signature expansive glass sliding doors and upstairs viewing decks were inspired by the striking panorama .... Whether seen in the dry season when it can appear desert-like and barren beyond belief or after the rain on one of those crystal clear days across the vivid green of new grass, the impression is always the same. It is boundless. This morning you will be transferred by private charter aircraft to the Xaxanaka region of the Moremi Game Reserve. 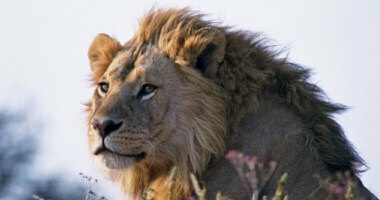 Enjoy 2 nights at Camp Moremi. Camp Moremi is situated on the beautiful Xakanaxa Lagoon in the eastern extremity of the Okavango Delta, within the Moremi Wildlife Reserve. Here, where the life-giving waters of the Okavango meets up with the vast Kalahari, ancient Mopane forests, open grassland, seasonal floodplains and riverine habitats have formed, creating one of the most magnificent and welcoming animal sanctuaries in all Africa. Moremi Wildlife Reserve supports the most diverse habitat and animal populations in Botswana, with possible sightings of wild dog, cheetah and leopards being the highlights. 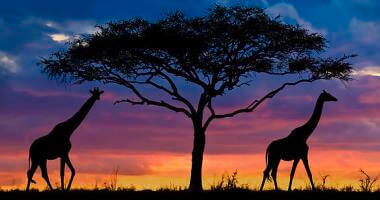 Resident species include lion, elephant, buffalo, hippo, giraffe, hyaena, zebra, kudu, lechwe, sable and roan antelope. You can thrill to the excitement of tracking these on open Landrover game drives conducted by experienced resident naturalists. Birdwatching is excellent throughout the year, with powerboat visits to the heronries on Gadikwe and Xakanaxa lagoons a highlight in the summer months. Camp Moremi also offers excellent fishing, assuring you of the most complete lodge experience in Botswana. Enjoy a full day of morning and afternoon game drives by open 4x4 safari vehicle, excellent bird watching, exploring the Xakanaka Lagoon and surrounding Okavango channels by powerboat. Today you will be transferred by private speedboat to Camp Okavango situated on remote Nxaragha Island, an exhilarating journey to the heart of the Okavango Delta, assuring a year-round water wilderness experience. 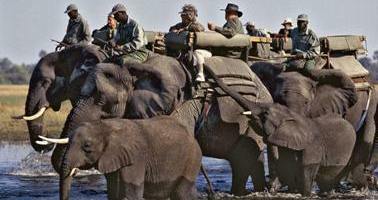 Enjoy 2nights at Camp Okavango on a fully inclusive basis. Honeymooners are catered for, and for those who demand the ultimate in exclusivity, Camp Okavango boasts the "Okavango Suite" where your stay includes private game viewing facilities. Unashamed luxury blends with the Africa of yore in the elegant thatch and lethaka main building which houses a cocktail bar, lounge and reference library. Adjacent to the main building is the dining room leading out onto a lovely shaded patio and outside fireplace. Camp Okavango's silver service dinner served by candelabra is renowned among knowledgeable Africa travelers. Shaded hammocks, reading benches and a delightful sundeck and plunge pool provide relief during the hot midday hours, whilst an elevated observation platform affords stunning views of the tranquil floodplains. This morning you will return by private charter aircraft to Kasane, in the northern extremity of the Chobe National Park, where upon arrival you will be taken by vehicle to a waiting speed boat. Then enjoy a cruise along the famous Chobe River to Savanna Lodge. Enjoy 2 nights at Chobe Savanna Lodge our brand new luxury lodge, located on the banks of the Chobe River in Namibia, overlooking the Chobe National Park, on a fully inclusive basis. Activities at the lodge are diverse and interesting. In addition to game drives by 4x4 vehicle in the Chobe National Park and private motor boats for water born game viewing, Chobe Savanna also offers something different; guided walking safaris along the river by professional guides, boat excursions to a nearby traditional village, where one can witness tribal African life, guided canoe excursions in Canadian style canoes and night game drives along the river. After breakfast, transfer by speedboat back to Kasane, where you will be met by a Desert & Delta Safaris representative for your 2-hour road transfer to Victoria Falls. 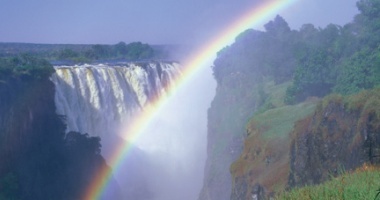 Upon arrival in Victoria Falls you will be under your own arrangements. Departures Daily ex Victoria Falls or Livingstone.